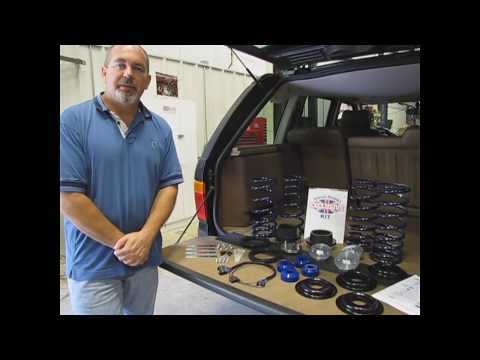 Cost-Effective Air to Coil Conversion Kits for Range Rover 4.4 vehicles! Electronic Air Suspension (EAS) systems found in Range Rover 4.4 2003 – 2005 models are notorious for their expensive, recurring maintenance problems. This economy-line Range Rover suspension kit (Part # L322SRK-C) is a perfect alternative for customers looking for a cost-effective alternative to the burden of EAS repair. A once-and-done solution that can save you thousands of dollars over the lifespan of your Range Rover! This kit provides all of the components and hardware needed for the suspension conversion. This includes four custom-designed coil springs - front right, front left, and two rears – The kit will re-use the Range Rover’s stock Delphi struts. Coil kit installation including disabling the EAS Control Module only takes 4 hours and each kit features detailed installation instructions with photos. Custom-designed and manufactured hardware and wiring for straightforward installation. This kit increases the vehicle's ride height over stock by about 1" (26mm) in the front and about 1" (26mm) in the rear. Ride height figures are based on measurement from the center of the hub to the center of the wheel arch.